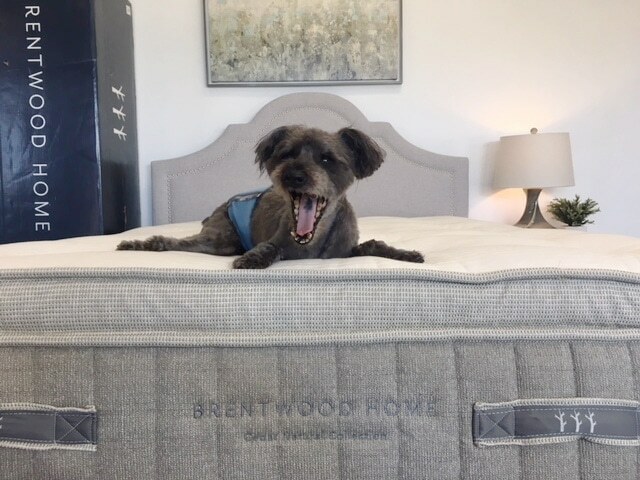 Brentwood Home is one of the most-trusted online mattress companies out there. They provide high-quality products with outstanding durability and performance. The Cedar is a luxurious hybrid made from four layers of top-notch materials. You’ll experience a medium feel with designs features that check off all the boxes for a superior build. The Crystal Cove is a dual-sided mattress that allows you to change the firmness level with a simple flip. On one side, you get a luxury-plush comfort while the other provides a gentle-firm feel. Each mattress will give you a different sleeping experience, making it important to know everything about both. By the end of our Cedar vs Crystal Cove mattress comparison, you can conclude on which is better for your needs. 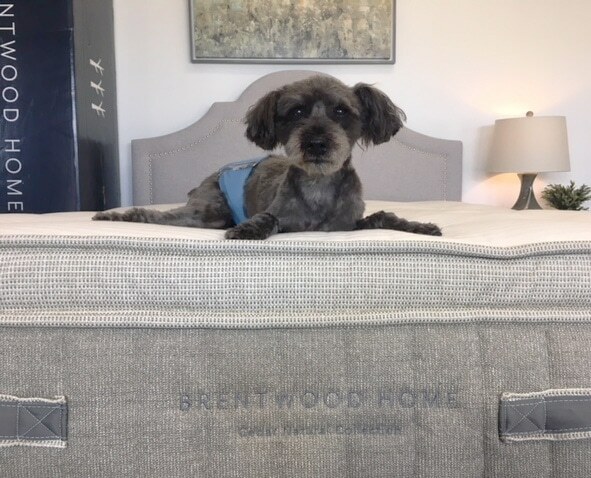 The Cedar mattress from Brentwood Home was designed with the utmost luxurious sleep in mind. The 13-inch thick bed is made from two layers of latex, a strong coil system, and a coconut husk support. This is all topped off with a layer of wool batting and wrapped in an organic cotton cover. The medium firmness level will give back and side sleepers an optimal comfort. Heavier sleepers and stomach sleepers who like a contoured feel will also enjoy this mattress. The Cedar is more expensive, but you can save 15% when you use our coupon code, OURSLEEPGUIDE15 at checkout. Learn more about the Cedar mattress in our in-depth Mattress Review or at BrentwoodHome.com. Altogether, this two-sided mattress measures in at 13 inches thick. The Crystal Cove contains a strong coil set and features one layer of latex and two layers of foam. The cover for this design is removable for easy cleaning. The different sides of this mattress will give you different levels of firmness for optimal comfort. This feature is especially helpful for those that do not know which firmness they prefer. It’s also great for those expecting a change in life, like pregnancy or injury. No matter which side you choose, you’ll experience consistency and durability. 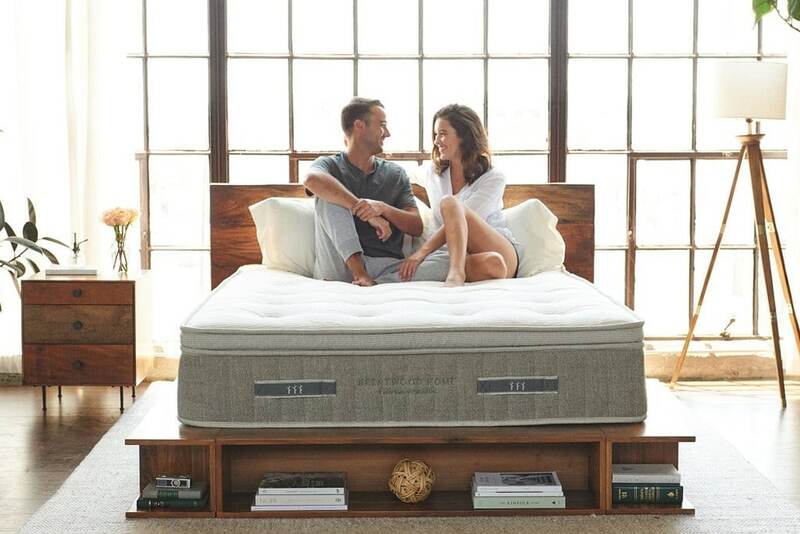 Find out everything you need to know about the Crystal Cove in our in-depth Mattress Review of at BrentwoodHome.com. It’s important to consider all your options for delivery and setup for your new mattress. A queen-sized Cedar weighs 135 pounds, making it difficult to maneuver. You will certainly need two people to get it in place and unboxed. With the do-it-yourself option, a compact box will arrive at your doorstep soon after your purchase is processed. You can also choose a white glove delivery service for a fee of $199. 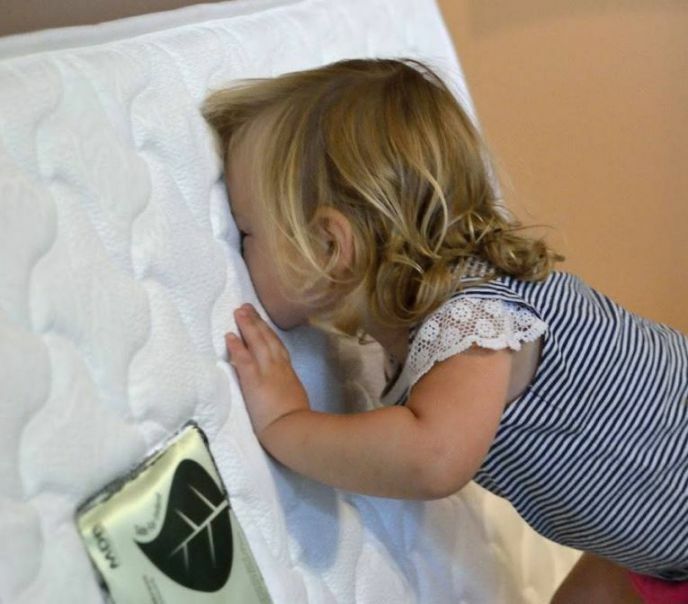 This add-on saves your back by having a team set up your new mattress for you. For an extra $76, they will even haul away your old mattress. Since the Crystal Cove comes from the same Brentwood Home company, you can experience the same upgraded services. A white glove delivery option for just $199 will give you the convenience of a hands-free setup. Have your old mattress removed for only $76 more. If you would rather manage on your own with help from a friend, you can select the standard drop shipping. This gets you quick delivery after processing in a compressed and roll-packed method. It’s a great value from the company to have a few options available to make your experience easy. Choose between luxurious comfort with the Cedar or double-sided options with the Crystal Cove. Your encounters with off-gassing should be almost unnoticeable with the Cedar mattress. This is true for either shipping method because the bed is made from natural components. Using the least toxic materials is an aim the Brentwood Home prides themselves in. A small smell could be present from the new materials or plastic wrapping. Dunlop latex, organic cotton, and wool put off only natural odors. When you unwrap the Cedar, it will rapidly expand. Allow around a full day for any lingering smells to dissipate while it firms up. Avoid the area if any fragrances bother you. The Crystal Cove has a similar off-gassing experience, whether you select drop shipping or white glove delivery service. Once unrolled and unwrapped, it will quickly come to life as it expands. Allow a few hours to a day for the mattress to fully firm up. During this time, you might notice some faint odors from the natural components of this build. Ensure there is proper ventilation to encourage dissipation of these smells. Brentwood Home’s commitment to using natural materials should keep off-gassing to a minimum. You’ll undergo a luxurious experience right from the start with the Crystal Cove. Though these two mattresses come from the same company, they have two distinct takes on comfort. The Cedar uses the hybrid combination of a coil set and latex to provide support and pressure relief. You’ll experience a medium firmness level that suits almost any sleeper whenever you lie down. The Crystal Cove has two separate sides to provide flexible comfort options. On one side, you’ll experience a gentle-firm feel, while the other provides a luxury-plush firmness. Different sleeping positions will be more comfortable on one side over the other. No matter which one of these mattresses you choose, you’ll have outstanding comfort from the all-natural, high-quality materials. The contouring that you get while sleeping on a Cedar mattress comes from two layers of Dunlop latex. This responsive material will give you ultimate pressure relief like a soft hug. A durable core is created by a set of coils that are zoned for targeted precision. You’ll get support exactly where you need it to create proper alignment. Back sleepers will have cradling at the neck and shoulders with strength through the lumbar. Side sleepers will get adequate sinking at the hips and shoulders. Even stomach sleepers and larger sleepers who prefer a softer feel will get satisfactory comfort. On a firmness scale where 1 is softest and 10 is firmest, the Cedar is a 5-5.5. No matter how you sleep the durable, high-end products used to construct this mattress are evident. With the Crystal Cove, you get two beds in one. This mattress is double-sided for double the comfort options. The gentle-firm side features Dunlop latex that contours responsively. It has a medium-firm feel that will be ideal for stomach sleepers and heavier sleepers. Back sleepers who prefer a firmer feel will also enjoy this level of support. The luxury-plush side uses a charcoal infused memory foam to give you deep comfort. This medium firmness level will be more suited to side sleepers and back sleepers who prefer a softer comfort. The beauty of the Crystal Cove is changing your mind at any time by simply flipping the mattress over. The Cedar mattress is made from a total of four separate layers. This hybrid design measures over 13 inches thick. The top layer is a 2-inch thick, 4-pound density natural Dunlop latex with a medium feel. This responsive material provides a consistent contouring all over for maximum pressure relief. The next layer of Dunlop has the same thickness and density, but it is cut specifically to create targeted zones. This design achieves more pressure relief or support depending in separate areas for a balanced feel. The Cedar also features a durable coil system made from 8-inch thick coils. 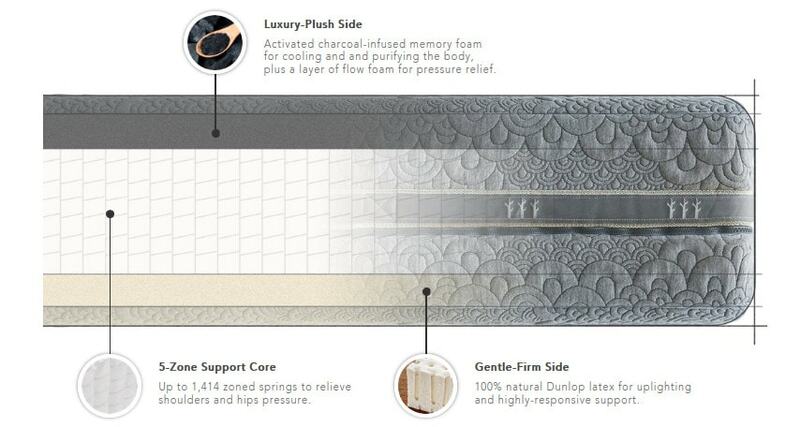 There are 1,130 individually wrapped coils in each queen size mattress. Flexible support creates precise contouring where you need it most. Edge retention coils run along the perimeter of the mattress for consistency no matter where you sleep. These coils also run through the lumbar zone for increased support. Under the coil set is a 1-inch thick coconut husk support. It provides antimicrobial benefits while forming an even surface for the rest of the materials to work from. An organic cotton cover with a layer of wool batting finishes off this design with breathable softness. Shop the Cedar and save 15% with code OURSLEEPGUIDE15 at BrentwoodHome.com. You essentially get two hybrid mattresses with the Crystal Cove from Brentwood Home. Different materials give you distinct feels on either side. The gentle-firm side has a 2-inch thick layer of Dunlop latex. It is responsive to keep you from feeling stuck and aerated to keep you cool. The luxury-plush side is made from a 1-inch thick layer of flow foam over a 2-inch thick layer of charcoal-infused memory foam. These two components make for a cushioned feel of softness. While the memory foam relieves pressure points, the charcoal cools and purifies the body. An 8-inch thick coil system separates the two sides, providing support to both. It is zoned for ultimate ergonomics and superior spinal alignment. Even weight distribution is easily achieved with targeted precision for optimal sleep. You will feel this same core support with whichever side of the mattress you choose. The cover of the Crystal Cove comes off with a zipper for easy washing. It is free from wool to promote a vegan concept. Shop the Crystal Cove and save 15% with code OURSLEEPGUIDE15 at BrentwoodHome.com. Motion transfer is important to consider with hybrid mattresses. Coil set provide flexible support for deep contouring. The Cedar’s coil system is targeted in zones to provide extra strength for certain areas. It is also reinforced around the perimeter. The coils are also individually pocketed. This drastically cuts down on movement traveling from one side of the bed to the other. Responsive layers of Dunlop latex also can produce a more buoyant sleeping experience. Luckily, these components are dense enough to absorb most vibrations. The Cedar might not be best for light sleepers, but most people will sleep undisturbed. The Crystal Cove mattress is also a hybrid, featuring a coil system, latex, and foam. You may experience motion transfer just a bit differently depending on which side you choose. The core of the mattress is a thick set of 8-inch coils. They are reinforced in precise zones and around the perimeter to provide extra support where necessary. These coils are also individually wrapped to prevent the motion from going across one by one. On the gentle-firm side, you have a thick layer of Dunlop latex. This responsive material would generally create more motion transfer. However, it is dense enough to absorb many vibrations. The luxury-plush side uses flow foam and memory foam, which will deaden any movement. This makes this side of the Crystal Cove more attractive to light sleepers. 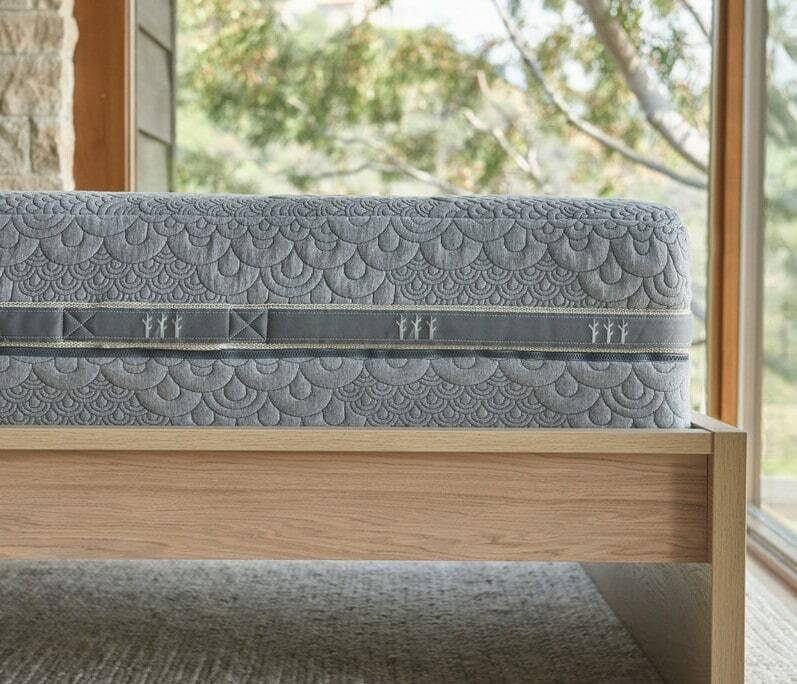 The Cedar mattress is rated #2 in our Best Mattresses for Hot Sleepers guide. You will have the automatic benefit of a coil set to provide excellent air circulation. On top of this supportive core, you get two layers of aerated Dunlop latex. This material is responsive enough for you to easily change positions any time you get too warm. The open channels allow hot air to dissipate almost instantly. A layer of wool batting sits atop the latex to wick away moisture while providing anti-microbial and dust-resistant benefits. Finally, a breathable organic cotton cover keeps you cool with proper airflow. The Crystal Cove also benefits from having a coil system as its core. It allows air to flow though evenly and quickly to generate healthy circulation. The support created by strong 8-inch springs will keep you from sinking in where warm air can become trapped. On the luxury-plush side a layer of flow foam rests on top. Having a barrier between you and the memory foam will combat the heat retaining properties of the dense material. The memory foam side of this mattress does okay at temperature regulation, but you’ll notice the Dunlop side is cooler. That’s because this material is naturally aerated to encourage proper airflow. It is also responsive allowing you to easily switch positions when you get too hot. The Cedar is a hybrid mattress from Brentwood Home. This means you get the support of an outstanding coil system. Dunlop latex will also give you flexible support that cradles you with a consistent feel. 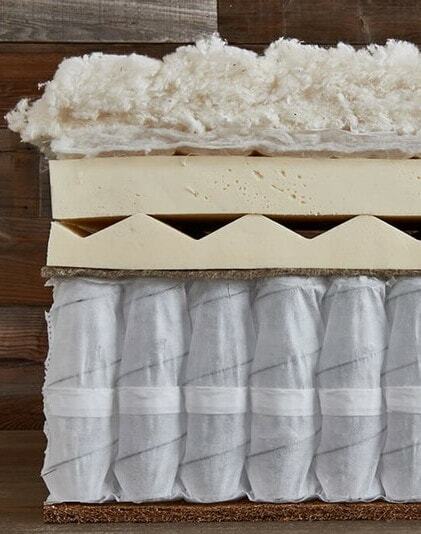 Setting up this mattress for success is a coconut husk support layer, which creates and even surface to start from. The coil set is reinforced through the lumbar and at the perimeter. Allowing you to sleep right up to the edge without feeling like you’ll roll out. You can even sit at the side of this mattress to get ready for bed or to start your day. And shouldn’t sense a sliding sensation like with other mattresses. 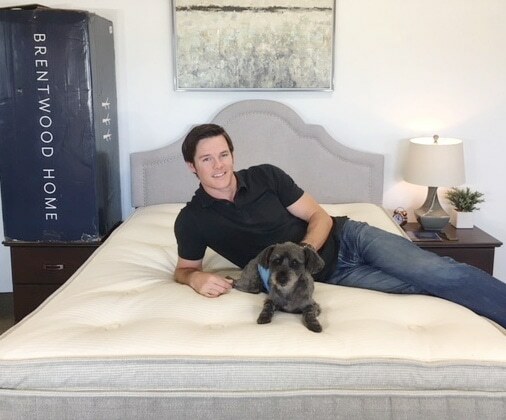 The Crystal Cove is another hybrid mattress from Brentwood Home. The big difference is that it is double-sided with two different experiences for edge support. The coils system in this mattress also uses reinforced coils around the perimeter to give you balanced comfort. Both sides of the bed have the advantage of this durable core to make sleeping feel the same. This is true no matter where you lie, whether sleeping on the gentle-firm or luxury-plush side. The Cedar mattress from Brentwood Home costs $1,949 for a queen size. Take advantage of our exclusive coupon to save 15% off with code, OURSLEEPGUIDE15, at checkout. This will bring your price down to a more manageable $1,656. Included in this price is standard drop shipping, but you can upgrade to white glove deliver service. This additional service is $199, and old mattress removal is another $76. Brentwood Home offers an outstanding sleep trial period of 365 days. That’s a whole year to test out the Cedar mattress. You’ll also have the reassurance of a 25-year limited warranty. Interested in the Cedar? Learn more and shop at BrentwoodHome.com. The Crystal Cove is like getting two mattresses for the price of one. In a queen size, this bed cost $1,295. You can still take advantage of our 15% off coupon code, OURSLEEPGUIDE15, to bring it down to just $1,000. Choose from free drop shipping, or upgrade to white glove delivery service for $199. You can even have your old mattress removed for another $76. The unbelievable 365-night sleep trial is included in your purchase. The 25-year limited warranty will keep you covered for years of flexible comfort. Interested in the Crystal Cove? Learn more and shop at BrentwoodHome.com. Cedar vs Crystal Cove – Our Pick! 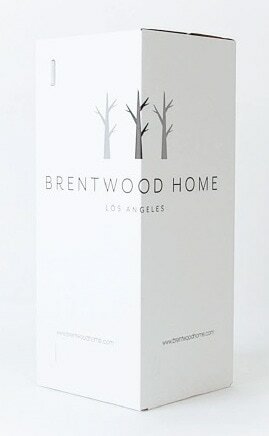 Brentwood Home has outdone themselves with these two amazing products. While the hybrid builds of the Cedar and the Crystal Cove provide some similar benefits, the differences stand out. The Cedar combines latex and a coil system for one of the most luxurious sleeping experiences out there. You’ll get a medium feel for ideal comfort that suits almost anyone. You’ll also feel the cooling powers that ranked this mattress in our #2 spot for Best Mattresses for Hot Sleepers. 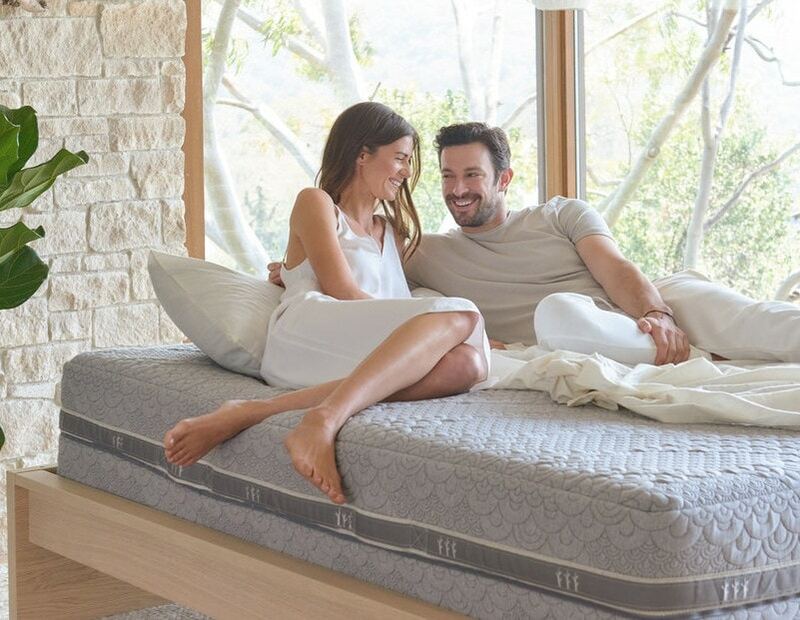 The Crystal Cove mattress might not feel quite as luxurious, but you will have the benefit of two different firmness levels. It’s like getting two beds in one with a latex side and a memory foam side. You should choose the Crystal Cove if you’re unsure of what comfort level you need. If you know you want latex and are looking for luxury, the Cedar is the way to go. Still unsure? Check out our FULL review of the Cedar HERE and the Crystal Cove HERE! For more comparison reviews beyond the Cedar vs Crystal Cove mattresses make sure you check out our Mattress Comparison Page. This will give you access to all our comparison reviews. Including some of our most popular including the Puffy vs Purple, Casper vs Tuft & Needle, Puffy vs Nectar and Puffy vs Puffy Lux.